Danny Welbeck helped himself to a first senior hat-trick as Arsenal ripped a wretched Galatasaray defence to shreds in a 4-1 win at the Emirates Stadium. Alexis Sanchez also netted four minutes prior to half-time when he dashed onto a Mesut Ozil pass to slide the ball beyond visiting goalkeeperFernando Muslera. 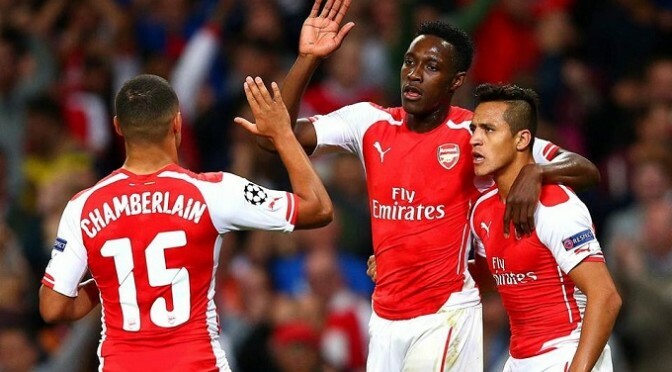 Galatasaray coach Cesare Prandelli’s ill-advised decision to operate with three defenders began to unravel on 22 minutes when Welbeck accepted an intelligent pass from Alexis to prod the ball under Muslera. He added his second on 30 minutes as Aur©lien Chedjou failed to connect with a header allowing Welbeck to race away from Felipe Melo before finishing with some ease. The third came from an Alex Oxlade-Chamberlain pass on 52 minutes before Arsenal goalkeeper Wojciech Szczesny was sent off for a last-man challenge on Burak YÄ±lmaz, who converted the consolation goal on 63 minutes. Arsenal’s 10 men were never overly tested, but David Ospina did well when he replaced Szczesny. On what was a bad night all round for the Turkish club, flares were tossed onto the Emirates pitch coming from the animated 3,000 visiting fans. They are sure to face punishment from UEFA, but Arsenal recovered well from their 2-0 mauling at Borussia Dortmund in their Group D opener to boost hopes of reaching the last 16.